The day our cat Tiger died my husband picked up a flyer about a Siamese cat being given away to a good home. I rang the owner that day to explain we had two cats, but if they got in a bad spot to call me and I would take the cat. We didn’t follow up after Tiger died thinking that if the owner called it was meant to be. 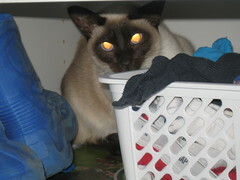 Well, they called and we now have CoCo a female Siamese cat installed in our home. CoCo is not really happy about the situation and we are hoping she will come around in time. I am trying to make light about it here, but she is seriously not happy right now. I rang the vet and he said to give it time. Hopefully with time, love and good food, she will come to love us. Right now there is a lot of hissing, claw swinging and hiding. Wish us luck! Sloan’s God Mother is having a baby in early September. 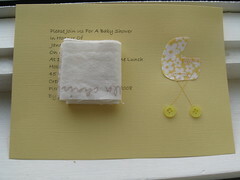 I am throwing her a shower in a few weeks and these are the invitations I made. 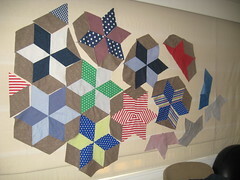 They are copied from Anna Maria Horner’s website. How cool is her website? The pillowcase dress is on my “to sew” list. I don’t have a theme for the shower, other than “drink lots of champagne” at my place. If you have an good game suggestions, would love to hear them. We are big fans of Maisie Mouse. It is so funny because Maisie didn’t enter my world with my first child, but Sloan is a huge fan. The books and illustrations are so sweet and that Tallulah! 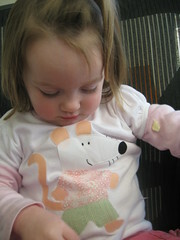 Next shirt will definitley be a Tallulah creation. I posted a close up of the shirt on Flickr. Melbourne was so fun! What a great city!!! The food and the fashion! Overall the vibe was so amazing. I loved how everyone dressed so individually and their clothes looked more like works of art rather than functional wear. When I think of Melbourne I think of the word “groovy”. My girlfriend and I went to the Melbourne Design Markets at Federation square thanks to the heads up from Jodie at Ric Rac. So many cool designs and the place was heaving with visitors. The photos above were presents for a good girlfriend who just had her third baby boy. I made a pillow for each of the boys. I had to sneak them out the door because Rhys had his eyes on that helicopter one. It took me a day to recover post all day play date with three of Rhys’ friends. 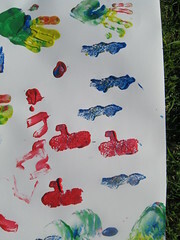 I tried out a few crafts on the boys and the sponge painting was a hit. I cut a few submarines and cars out for them to sponge with and they were kept busy. I’m off tomorrow for a girls trip to Melbourne for the weekend. Two weeks of school holidays…….I am thinking I deserve it. : ) I made a few pillows for a friend who just had her third, yes third, boy. Will hopefully post some photos tomorrow of them before I go. Entering into week two of school holidays and I decided to break out some serious kid craft. 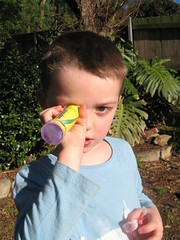 Rhys loves playing with kaleidoscopes at school. I checked out a book in the library on how to make your own at home. The library book projects were a bit advanced for what I wanted and the materials hard to source. I searched the Internet and found this video which was more our speed and the materials were at hand. We started the project and there were a lot of hiccoughs along the way. The video makes it look so easy and it was not! I wish there was some audio with it to give you a bit more information. The video is just like Martha Stewart making everything look so easy and fast. Ha ha. The result was great and I have to say after learning the hard way the first time around, kaleidoscopes of the future will be easier. Big hit with my budding scientist and we all learning a lot. Exhausted post zoo visit. It was crazy with pilgrims! I have four, four year old boys coming to play tomorrow. Wish me luck!